The following EIGRP troubleshooting lab was kindly shared by one of my Linkedin contacts Thomas. I always welcome any labs that you may wish to share and will gladly give you credit in the post for creating them. For this shared lab I have created a topology drawing of the network so that you will have the IP addresses and subnet mask available. 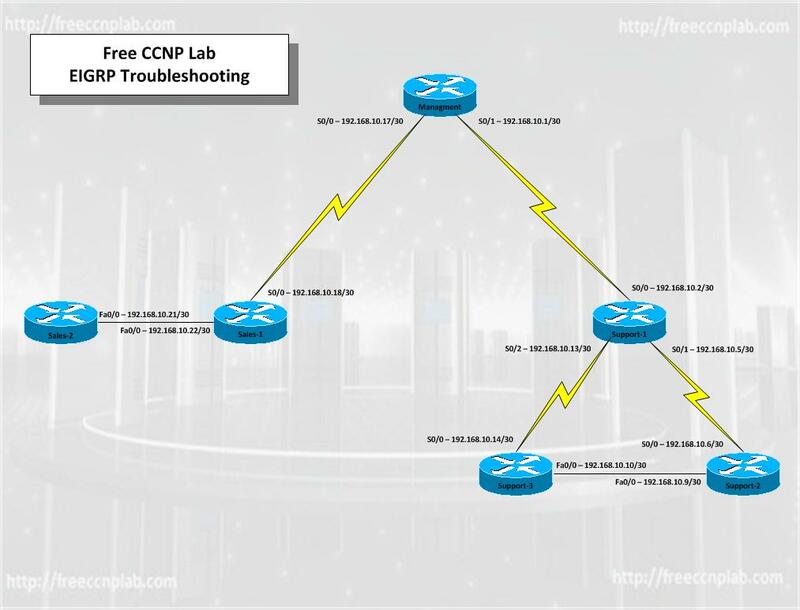 The lab has been created using GNS3 and the GNS3 topology file along with the configuration file are included and available for download. I have not made any changes to the instructions they are short and sweet. Mgmt_1 Router is not utilizing the no auto-summary command. Sales_1 Router is advertising AS 10 instead of AS 100. Sales_2 Router does not have EIGRP Protocol enabled. Support_1 Router Interface Serial 0/1 shutdown. Support_1 Router using AS 101 instead of AS 100. Support_3 Interface Fast Ethernet 0/0 speed set to 10 and should be 100. Support_3 Router advertising 172.168.10.0 network and should be 192.168.10.0. This will be last EIGRP lab for a while as I am now working on OSPF labs next.